Roughly one year ago, the Yankees found themselves in the same position they’re in right now: facing a do-or-die Game 5 at Yankee Stadium with a trip to the American League Championship Series on the line. It did not go great. The Tigers won that game 3–2, with Alex Rodriguez (who won't be in tonight's starting lineup) striking out to end the series. And so, with the Yankees facing another ALDS Game 5 later today, what can this group learn from last year’s series? Here, three things. But the critical third Detroit run — the one that ended up being the difference in the score — was allowed by Sabathia, who’d started Game 3 three days earlier and entered the all-hands-on-deck Game 5 in the fifth inning. 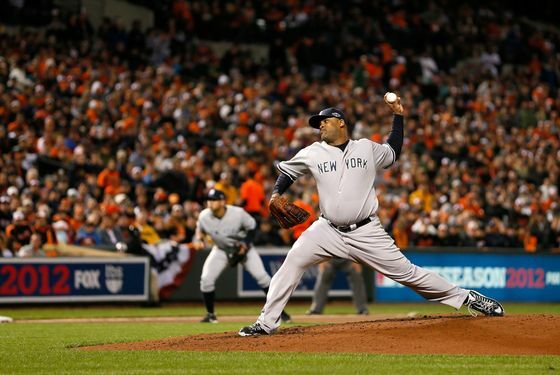 One hopes that Sabathia would be able to give the Yankees some length tonight, but if he can’t, or if Girardi needs to use relievers beyond his trusted core (like in an extra-innings situation), would he consider using, say, Andy Pettitte — the 40-year-old would-be Game 1 ALCS starter — before one of his B-relievers who’d at least be in their element pitching out of the bull pen? 2. One hit can make all the difference. A-Rod’s strikeout to end the series might have landed him on the tabloid back pages the next day, but by that point, the Yankees had already squandered opportunities to push across additional runs. The Yankees went 2-for-9 with runners in scoring position and stranded eleven base runners. They left the bases loaded twice: In the fourth, they did so with one out but couldn’t cut into Detroit’s 2-0 lead. Then in the seventh, they again loaded the bases with one out, but A-Rod struck out, Mark Teixeira walked to force in a run and cut the lead to 3-2, and Nick Swisher struck out to end the inning. Not to pick too much on one at-bat, but just a single by Swisher there could have plated two runs, with the shutdown combination of David Robertson and Mariano Rivera ready to come out of the bull pen. Instead, those two would pitch a perfect inning each but with their team trailing. Judging by the first four games of this series, tonight’s Game 5 may very well present the Yankees with a similar situation. All four games have been tight in the late innings, and the Yankees have had plenty of opportunities to score runs. Good thing everyone’s been hitting and taken advantage of these chances!